I read this just after Hallowe'en, when I fancied reading something scary. Blackout started well on that front, but the scariness didn't carry all the way through. Our narrator, Jon, and his wife live in a typical suburban American street. It's summer, and they and their neighbours have had a huge barbeque. Jon's had a bit too much to eat and drink, so he falls asleep on the sofa. When he wakes up everything is dark except for the strangely regular and much too frequent lightning, and his wife is not in the house. The neighbours are soon roused and helping with the search, until it becomes awfully clear that something big is going on. The tentacles falling from the sky and snatching people up are a bit of a clue. Like I said, this started out great. The first part, with Jon and his neighbours not knowing what's going on and going round in the darkness, trying to get help and figure things out, worked perfectly for me. 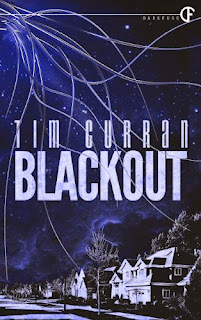 Curran creates a really effective creepy atmosphere and it felt believable. I had no problem buying that even if your gut is telling you that something is just WRONG, your response to your wife going missing is going to be to do what you're supposed to do: organise a search, try to get to the police, and so on. Once it becomes clear(ish) that what's going on is an alien attack, however, things concentrate more on the action, and that's just a bit humdrum. I mean, there's a lot going on, a lot of excitement, but I found it hard to care much and I certainly didn't feel scared (even though I was reading this in a mountain lodge in the middle of nowhere). Maybe it was that the characters were too undeveloped for me to care what happened to them. We get to know Jon a bit, but after the first sections, I wasn't quite feeling his reactions. It all felt a bit cold an unemotional. The resolution was cool in an intellectual way, but I get the impression I should have been feeling horror and despair. I didn't. I just closed the book and went to sleep. So, I enjoyed it, but it wasn't great.